American artist Jason Mecier found his own way of protesting against drugs. 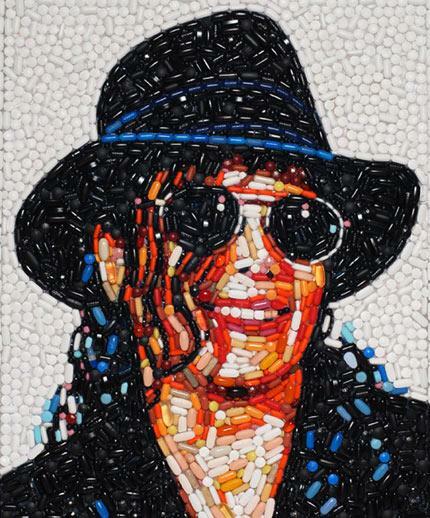 Choosing differently colored prescription pills, he created portraits of celebrities that had been victims of drugs, tackling the problem symbolically. Drugs have long been a frequent cause of death amongst celebrities around the world, taking down the most talented artists we’ve known, like Micheal Jackson, Heath Ledger, Amy Winehouse, and many others. The pill-mosaic portraits, emphasizing the dangers of drug abuse in a very innovative and blunt way, featured in the Celebrity Junk Drawer show, held at the Ghettogloss Gallery, in Los Angeles.